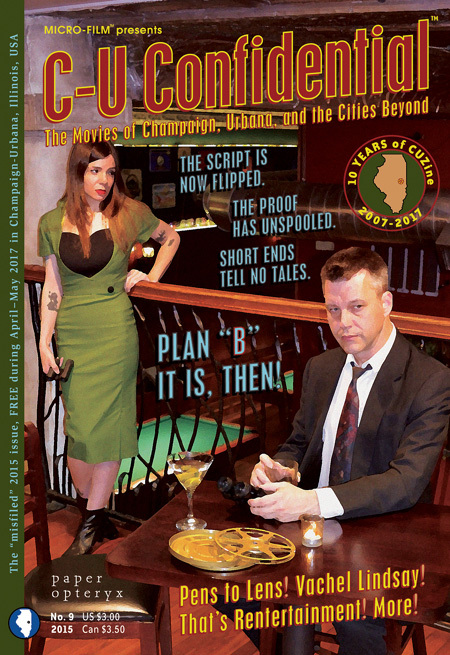 Allies in film and cultural expression made by the citizens of Champaign, Urbana, and the cities beyond, be sure to pick up the latest issue of C-U Confidential digest this extended weekend if you take a breather from spending time with family and close friends! Below is a current listing by alpha of locations where we’ve placed issue 9 with a valuable assist from our bespectacled man in Danville, Ripper the Clown; we highly suggest you pluck a copy today as stacks in certain locations are being whittled down faster than we can replenish them! (Supplies are limited, of course.) We hope you enjoy our current fit of cinema lit this Memorial Day or whenever you can work it into your Twin Cities lifestyle. 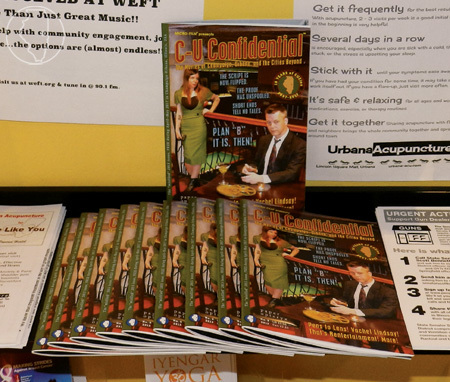 Also, we have finally revised our former “Zine of Our Scene” Page here on C-U Blogfidential and it is now a fully illustrated and better detailed counterpart, “Periodicals du C-U.” Take a look and make sure you have in hand every edition. That said, don’t forget to surf CUBlog this summer for first news on CUZine #10. Let’s hang ten, gang! More importantly, let’s remember the individuals who served in this country’s Armed Forces, perished in the line of duty, and by default helped shaped the world we live in today. We need to do this despite our individual feelings and rationalization over the continued reliance of military might and weaponry on behalf of “preserving the standing” of the United States of America. These people are and were human beings – husbands, wives, brothers, sisters, parents, uncles, and aunts – with souls and histories and triumphs and failings just like the rest of us so they should be considered as such. This weighs a bit heavily in the personal sense on your humble editor right now because a relative who is a veteran, even one who was able to live out his life unlike many other service men and women, is no longer with us. After more than a year of battling a brain tumor, Robert J. Gurzynski passed away at home in Florida last November and was laid to rest earlier this month on Monday, May 8, at Arlington National Cemetery in Virginia with full honors. He spent two decades enlisted in the U.S. Navy and completed his career as a mid-ranking officer, after which he worked as a contractor at the Shades of Green resort for active military personnel and their families at Walt Disney World in Orlando before retirement. Surviving is his wife, Sandra, three children, Robert, Dawn, and Scott, several grandchildren and great-grandchildren, and sister Patricia, mother to Mr. JaPan. We thank you, Uncle Bob (1949-2016), for your time on Earth and your contributions. Rest in peace. Coming soon to Springfield, Bloomington-Normal, and more! This entry was posted on Monday, May 29th, 2017 at 5:00 pm	and is filed under C-U Confidential, JP Confidential, Print Matter du C-U, Sad Places. You can follow any responses to this entry through the RSS 2.0 feed. Both comments and pings are currently closed.